A new online food drive is coming to Alberta on April 16 – the first of its kind in Canada – and will encourage donors to ‘Give Healthy’ to participating local food banks. Today, Food Banks Alberta, the provincial association of 90 food banks across the province, is announcing the provincial #GiveHealthy food drive. It is part of a larger, online food movement that hopes to influence the way people donate to their local food bank. Donors select from a variety of foods hand-picked by each food bank. The food will be delivered to the food bank when the campaign is over. It will arrive in peak condition and when the food bank needs it the most. Food bank usage in Alberta has increased 150% since 2008. Demand tends to increase in the summer months, while donations typically drop off. Forty percent of people helped by food banks are children. The #GiveHealthy food drive campaign runs April 16 – April 30, with a goal of raising 50,000 lbs provincially, a value of about than $125,000. There are 20 participating food banks in the campaign. Donors can contribute to a food bank specifically, or the provincial campaign. Food donated to each food bank will go there directly and food donated provincially will be shared with smaller food banks around Alberta. Food Banks Alberta is thrilled to announce that the Pembina Pipeline Corporation has joined us as the provincial partner for the #GiveHealthy food drive. Pembina has a long history of giving back to communities across Alberta, and is no stranger to supporting food banks. This year marks their third annual Fresh Food Fund grant. In 2017, this contribution helped 27 food banks purchase fresh, local and nutritious items. This year’s $110,000 grant will be available to food banks on April 2. “Food is such a basic need, and I can’t think of anything more important than making sure that our friends or neighbours in our communities don’t go hungry,” explained Dave Ellery, manager of Pembina’s Central District. 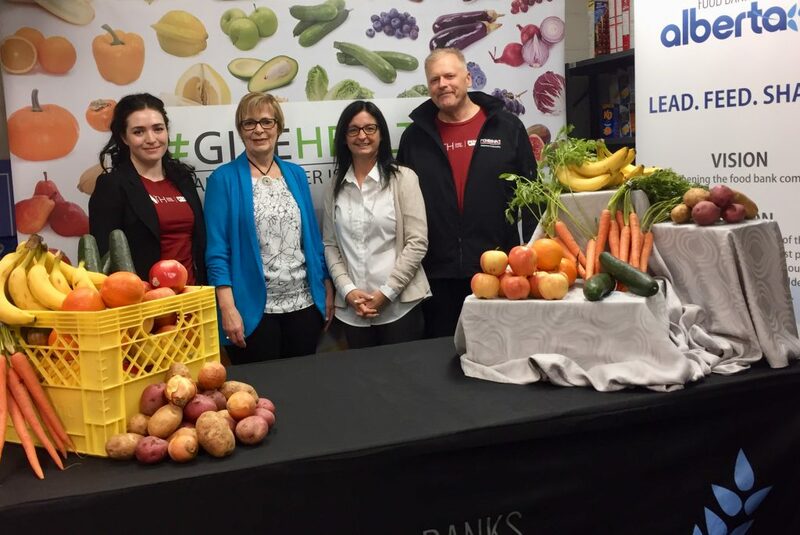 The Fort Saskatchewan Food Bank, who hosted the provincial announcement today, has benefitted from the Fresh Food Fund in previous years and values the commitment to healthy food donations by Pembina Pipelines Corporation and this unique food drive. “The Fort Saskatchewan Food Bank works hard to provide families with healthy, nutritious foods. We value the support to help purchase these products. Our food bank is very excited to be a part of this innovative food drive,” said Marlene Leroux, president of the food bank. The #GiveHealthy food drive encourages a shift toward giving more healthy food and donating food that food banks need to support clients. It is a grass-roots initiative that relies on word-of-mouth and social media sharing to spread the word and encourage participation. “To be able to donate a bag of apples, potatoes, or fresh carrots with just the click of the mouse makes giving healthy easy,” said Ms. Walsh-Rigby.